Earlier this week we saw the launch of the Nokia 8, but there was no sign of the Nokia 9 - yet new rumors suggest there will be another phone from the company soon. 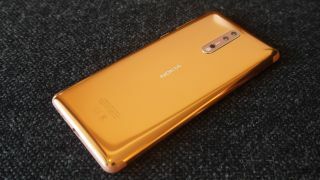 A representative for HMD Global - the company that is licensing the Nokia name for phones - has hinted there will be a Nokia 9 coming soon, which will have a larger screen than the Nokia 8. The rep said it will have a larger screen "to meet the needs of absolutely all users". The Nokia 8 comes with a 5.3-inch QHD screen, while previous rumors suggest the Nokia 9 could launch with a 5.5-inch QHD display. That would make the Nokia 8 just a little bit smaller, so it'll be a surprise if the brand then decided to separately launch a phone that only has a slightly larger screen. Whether that means the Nokia 9 is destined to have some new features that the Nokia 8 lacks remains to be seen. Previous leaks and rumors suggested a remarkably similar setup to the Nokia 8 with a dual-sensor camera, Qualcomm Snapdragon 835 chipset and an all-metal body design.